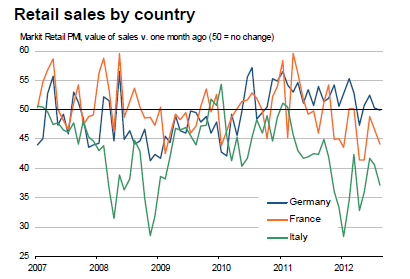 Eurozone Retail Sales Decline 15th Straight Month! Once again there is grim data from Europe. The safe thing to do is expect grim data every time European data is reported. Except for an occasional outlier, you will not be too far off. Retail sales in the Eurozone continued to fall sharply on an annual basis in August. The rate of contraction accelerated to the fastest since May, and extended the current sequence of continuous decline to 15 months. This was despite a further year-on-year increase in Germany, and reflected substantial declines in both France and Italy. Employment at retailers in the Eurozone declined for the fifth month running in August. The rate of job shedding remained modest, reflecting sustained workforce growth in the German retail sector. French retailers posted the steepest job cuts for over three years, while the rate of contraction in Italy eased since July. The Prices Paid Index rose for the third month running from May’s 19-month low in August, signalling a strengthening rate of inflation of wholesale prices in the Eurozone. Sector data signalled that clothing & footwear and food & drink drove cost pressures in August. Retailers’ gross margins continued to fall sharply in August. The rate of deterioration eased since July, but was still among the fastest registered to date. Reflecting the relative strength of demand, Italian retailers posted the steepest drop in margins, and German retailers the weakest.